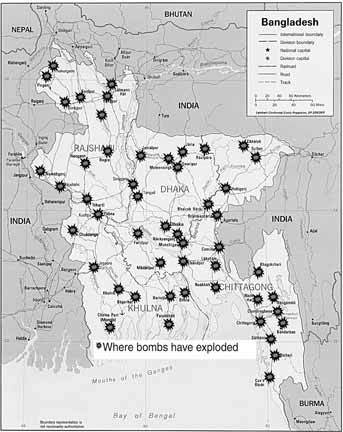 A former freedom fighter from Bangladesh, Saleh Chowhdury, who now lives in the United States, is concerned about what is happening in Bangladesh. “To get the country under their control, the Islamic Fundamentalist Party is trying to kill the intellectuals,” Mr. Chowhdury said. On the other hand some progressive minded political parties are getting together and demanding free and fair elections and the end of the terrorist activities by the Fundamentalists. To understand some of the problems of Bangladesh, it’s important to know how the country began. In 1947 India was divided into two countries, India and Pakistan. Pakistan had two parts East Pakistan and West Pakistan. East Pakistan was formally called East Bengal. West Pakistan consisted of Shin, Panjab, Beluchistan, and Northwest Frontier Province. The Bengali people protested against the exploitation and demanded their rights but the Pakistani ruler tried to suppress them with police and military. They tortured and killed many Bengali people. Finally, a Bengali leader named Sheik Mugibur Rahman made a six point demand for the autonomy of East Bengal, but Pakistani rulers ignored their demand and continued their exploitation. “They cancelled Bengali people’s right to vote and established a dictatorial government,” said Mr. Chowdhury. Bengali people demanded the right to vote by the leadership of Sheik Mugibur Rahman. Finally, the Pakistani ruler allowed a general election in 1970. Sheik Mugibur Rahman organized the Bengali people in East Pakistan and was able to get a majority of members in the Pakistan national assembly, but the Pakistan military dictator insisted on giving power to the elected representative and deployed military in the then East Pakistan. They started to kill innocent people, students, teachers, women, and children. “So the Bengali people stood against the killing and started the liberation war,” Mr. Chowdhury said. After 9 months of fighting, the Bengalis won the war and a free and independent Bangladesh began. Bangladesh was established upon four main principals of democracy, nationalism, secularism and socialism. The newly formed Bangladesh government banded all political parties based upon religion, but after three years of liberation some military officers killed Sheik Mugibur Rahman and took power. After this, the governments that followed worked hard to solve the problems of Bangladesh. Yet even though there were problems, the country was able to deal with them in a democratic way.